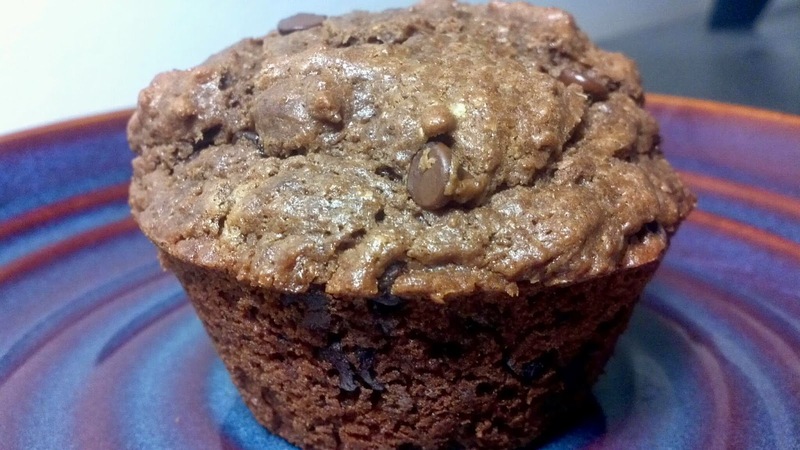 I based these muffins on my Whole Wheat Peanut Butter Muffins because they are high in protein (without adding protein powder). They are a little higher in calories than most of my muffin recipes, but they make a great on the go breakfast because they are so filling. I originally planned to add dried cherries to these, but was unable to find any at the grocery stores I went to, so mini chocolate chips won out. This recipe makes 12 muffins in a regular sized muffin tin, but they are much larger than some of the other muffin recipes I've made, so you could make them a little smaller and make 18 instead. Combine flour, baking soda, baking powder, and salt in a mixing bowl. In a second bowl, add oil, followed by brown sugar and mix well with a fork. Add almond butter, vanilla and eggs and mix. Transfer dry ingredients to wet, and add milk. Mix together, being careful not to over mix batter. Fold chocolate chips into the batter. Spoon even amounts of batter into each muffin liner and place in oven for 18 minutes. Insert a toothpick, if toothpick comes out clean, muffins are done.